This fully Waterproof Waist Pack is also submersible to 16 feet. Constructed with RF welding of PVC-FREE nylon reinforced TPU, this waist pack (fanny pack) will be great for you and our environment. And just like the Action Sports Hydration pack, is equipped with the patented Quick-Zip™ for quick and easy access that doesn’t sacrifice waterproof protection. Next, you’ll probably notice the oversized water bottle holders with an adjustable draw string closure and a solid bottom that offer extreme durability. What might not be quite as obvious is that when attached to the Action Sports Hydration Pack, these bottle holders form the base for securing accessories such as ski poles, oars, fishing poles, fly rod tubes, hiking sticks, etc. 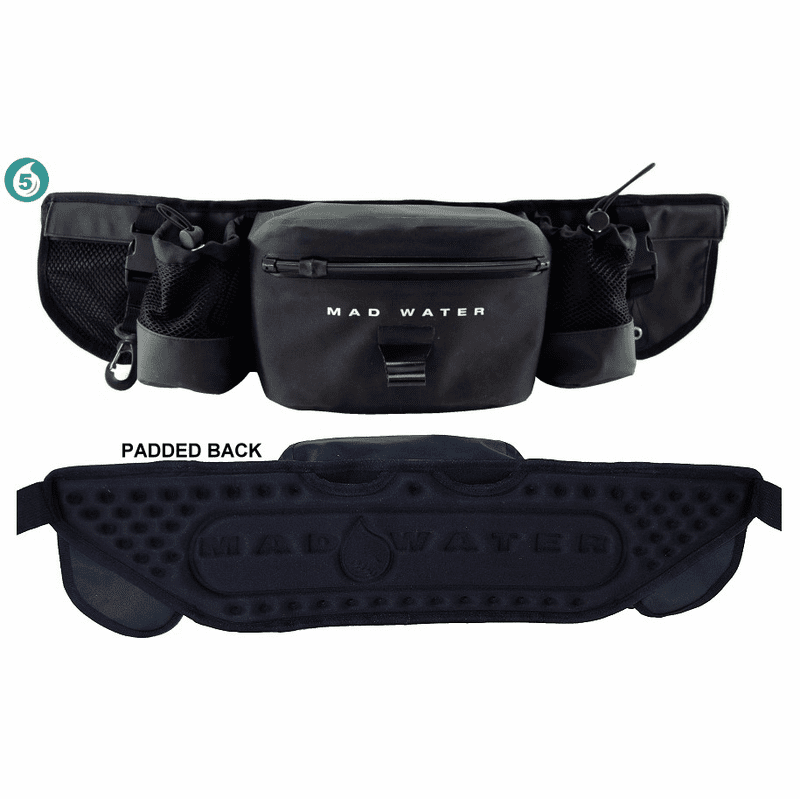 Other features of the Deluxe Waterproof Waist Pack (fanny pack) include a mesh pocket with Velcro™ closure, a gusseted solid pocket with Velcro™ closure, a removable compass holder accessory, a removable multi-purpose clip, 2 fixed D-rings, an adjustable 1.5 inch wide waist belt, and a lightweight breathable padded back, designed for wet or dry comfort. Each Waterproof Waist Pack is fully compatible with Waterproof Action Sports Hydration Pack and/or the Angler’s Chest Pack.